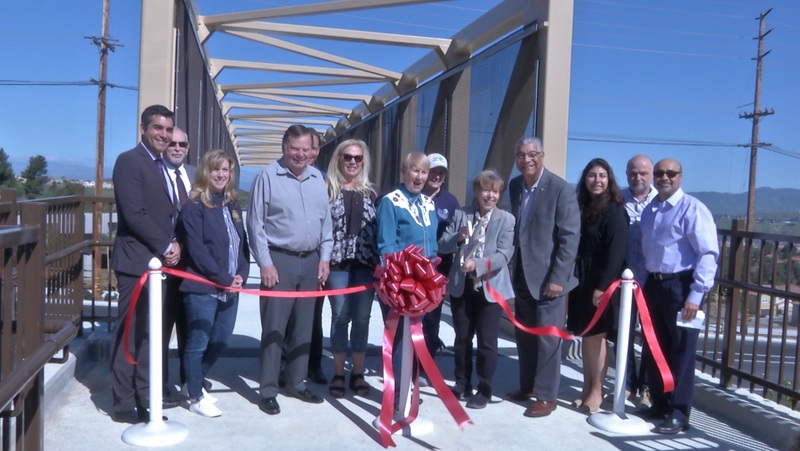 [City of Santa Clarita, March 29, 2019] – This morning City officials held a public ribbon cutting ceremony to celebrate the completion of the Sierra Highway Pedestrian Bridge, located at the corner of Golden Valley Road and Sierra Highway. City officials, elected officials, Caltrans, and local residents were present to ceremonially cut the ribbon. The new steel-truss pedestrian bridge is the first of its kind in the area, and is located near an intersection that receives roughly 60,000 vehicles per day. “Due to the high volume of vehicle traffic, plus children walking to school, the need for a pedestrian bridge and road enhancements was necessary to keep everyone safe,” added the Mayor. The bridge is also a great connection for cyclists and pedestrians who use the off-street Class I bike paths on Golden Valley Road. Going northbound, the bike path connects to the Santa Clara River Trail system, which provides miles of trails for recreational and commuter opportunities. “Now that the bridge is open, we strongly encourage our residents to use it to get to school, commute to the other side of the neighborhood, and for recreational activities such as cycling and running,” added the Mayor. The multi-million dollar project was made possible with a $1.4 million Federal Active Transportation Grant, $273,786 in funds from Transportation Development Act Article 8, $825,345 from Measure R local returns, $1,827,098 from Developer Fees, and City funds of $43,643. The project included the pre-fabricated steel truss pedestrian bridge and improvements to surrounding traffic circulation and new trail connections. Multiple street improvements were made on the west side of Sierra Highway. Enhancements included construction of a new bus turnout and right-turn lane from southbound Sierra Highway onto Golden Valley Road, along with a new sidewalk, bus shelter pad, enhanced access ramps and crosswalks, parkway landscaping, and an extension of the median nose. As part of this project, the intersections of Sierra Highway and Rainbow Glen Drive, and Sierra Highway and Golden Valley Road, also received pavement maintenance, traffic striping and signal modifications to allow for U-turns. New street lights will also be installed as part of the project. This bridge is part of the City’s Santa Clarita 2020 plan of Building and Creating Community. The Sierra Highway Pedestrian Bridge is part of the Building and Creating Community theme in the Santa Clarita 2020 plan. To learn more about the plan, click here.